Hello, Tallie here. 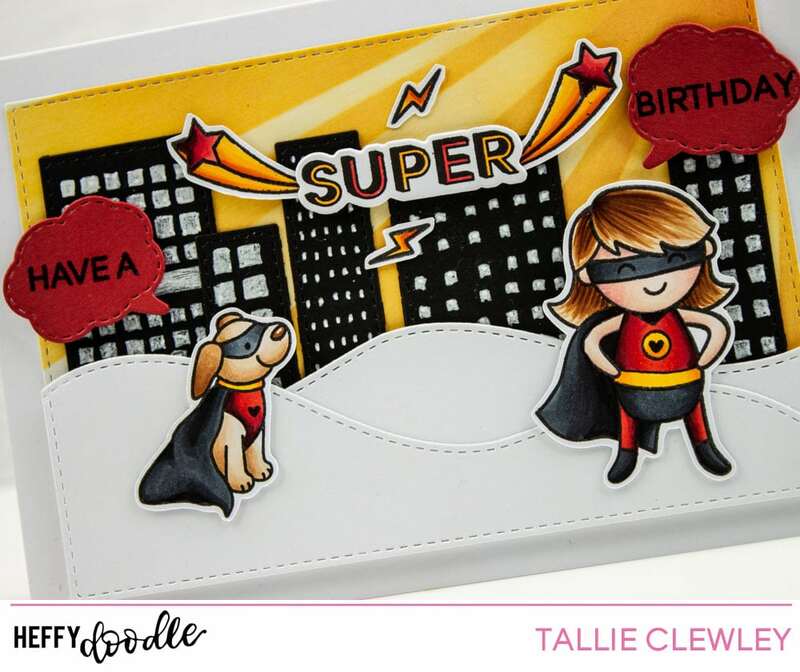 I have a super fun project to share with you today featuring the Superdudes stamp set from Heffy Doodle and the exclusive not-yet-released Rescue Dogs set (currently free with orders over £30). I love this style, playful theme and the bright colours! Change up the colours and this could be a great masculine card. 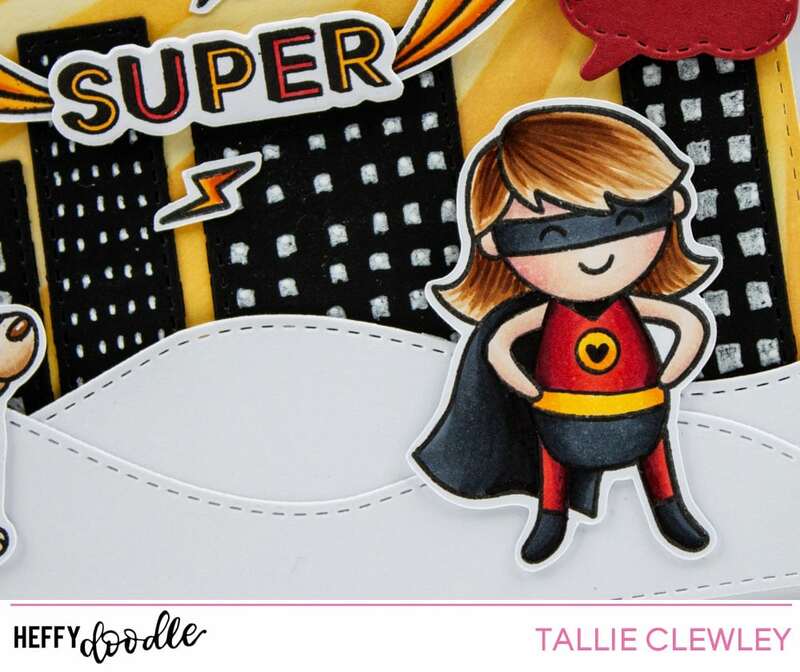 I started out by stamping the Super Lady, the shooting stars, lightening bolts and the SUPER word art from the Superdudes stamp set onto some blending cardstock in some Memento Tuxedo Black Ink. 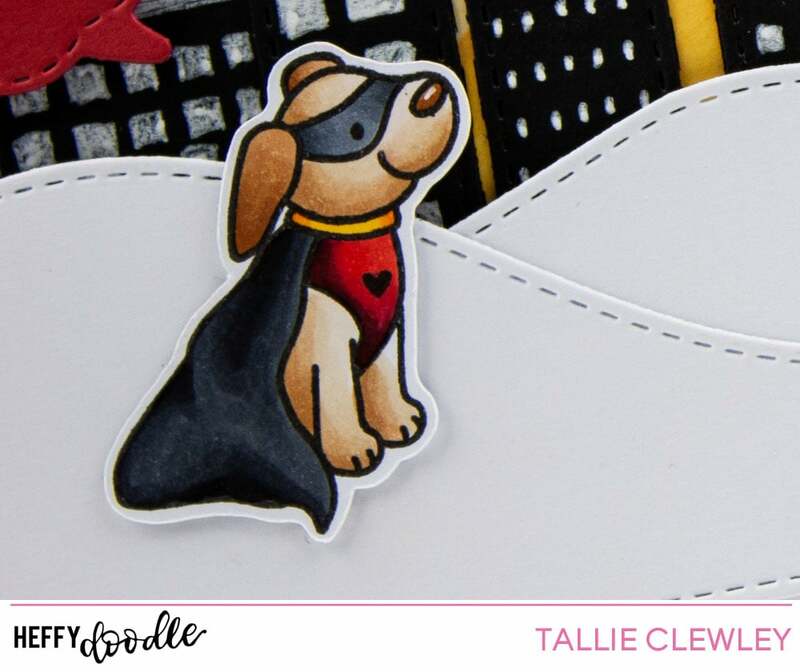 I also stamped out the super doggie from the Rescue Dogs set. I used a three colour marker combo (anyone guess which Disney superhero costumes I was inspired by?) of red, yellow and black to colour in with my Copic markers. I used several markers in each colour to build up the depth. I cut these out with the coordinating dies. For the sky background, I used some Spiced Marmalade, Fossilised Amber and Squeezed Lemonade Distress Oxide Ink over the Rays the Roof stencil to give that classic comic book sunset look. I cut this out with the second largest Metric Stitched Rectangle die and mounted it onto a white horizontal A6 card base. I used some of the smaller rectangle dies to cut out some buildings from some black cardstock, using a white gel pen to add some window detail. The Stitched Slopey Joes border dies helped to cut two ground pieces from more white cardstock. I used some foam tape to mount these over the background panel to give some dimension to the scene. I arranged the heroes and pieces on the scene aiming for the ‘POW’ type effect, mounting them with some more foam tape. I used the Whatcha Saying Now Dies to cut two speech bubbles from some red cardstock, stamping out the ‘HAVE A’ and ‘BIRTHDAY’ sentiments on them from the Superdudes stamp set. Thanks for reading, hope you got some inspiration!